We were diving off Port Shepstone, which is about 75 miles (120 km) south of Durban. We would board the inflatable boat at the beach and then the coxswain would find the best way through the surf. We would be dropped off for a drift dive in about ninety feet of water. The coral isn’t as lush in this part of the Indian Ocean, and the visibility not quite as good, but some of the beautiful tropical fish were still the same. 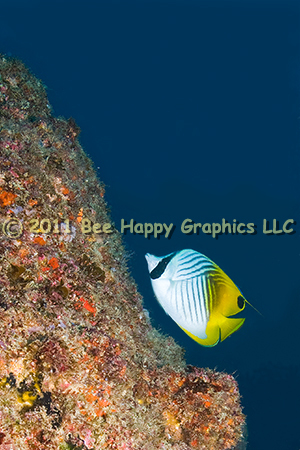 This butterflyfish was close to the southern edge of its range. Not considered deep water species, it was also close to the edge of its depth range. Photographic details: Canon EOS 30D camera w/ EF 20mm f/2.8 USM lens in Aquatica 30D housing. Ikelite Substrobe 200 was used. Camera was on f/8 for 1/125 sec at ISO 100. Fine Art Paper 14" x 11" 151/2" x 12"
Canvas N/A 22" x 14"